The Sunset Royal Beach Resort's all inlcusive property is a fantastic choice for families, couples and friends seeking a relaxing beach holiday. 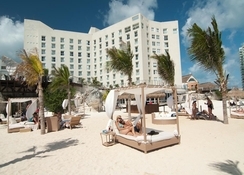 This Cancun hotel is located steps from the Caribbean Sea, in the lively Hotel Zone, and is within walking distance to the resort's top night spots, restaurants, shops and bars. This beachfront hotel offers bright white sands and a host of watersports to take part in, plus a schedule of other exciting activities and facilities including a swimming pool, spa, gym, dance lessons, cocktail making, volleyball, Spanish lessons and, of course, diving. Sunset Royal Beach Resort has 201 comfortable guest rooms, with rustic, colourful and arty interiors plus the necessary amenities for guests to enjoy their stay by the sea. The hotel's restaurant scene boasts five delicious buffet-style options for guests to choose from, plus evening entertainment thrown in too. 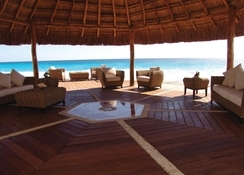 Sunset Royal Beach Resort is located in the heart of the Hotel Zone of Cancun. The hotel is 1km from the Cancun Convention Centre, 1km from Plaza Forum and Plaza Caracol, and within 2km you can find the Interactive Aquarium, La Isla Shopping Mall, Luxury Avenue and Plaza Kukulkan. Visit the El Rey archaeological site which is 3km from the hotel. 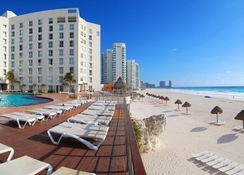 The Cancun International Airport is a 20-minute drive from the hotel. Enjoy spectacular views of one of the most beautiful beaches of Cancun when you stay at Sunset Royal Beach Resort, since the sand is just steps from your hotel room. The air-conditioned suites feature modern décor, a safe, a flat-screen cable TV, a balcony and a kitchenette with a microwave. Some rooms have a sea view, and offer a sofa, seating area and private sauna. All suites also have a private bathroom with free toiletries and slippers. Guests can choose between Deluxe Rooms, One-Bedroom Suites and Two-Bedroom Suites. Sunset Royal Beach Resort offers a blend of International cuisines, with a focus on Italian and Asian flavours, across its five buffet-style restaurants.Acuario, Capriccio, Aqua Grill, Bamboo and Moonlight Theatre offer guests a variety of breakfast, lunch and dinner settings – with a little entertainment thrown in too. 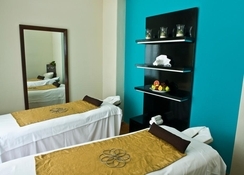 The hotel offers a host of leisure and fun activities for the entire family. Enjoy snorkelling, kayaking and canoeing in the crystal Caribbean waters. The hotel also arranges for biking facilities and Pilate classes. Lounge by the outdoor pools at the hotel and indulge in beach volleyball, dance, cooking and cocktail lessons, aqua aerobics, Spanish classes. Guests can also go for scuba diving with lessons given on-site.